On our website, we discuss the basic rules of the Klondike Solitaire card game but, if you want to become a real expert and complete the game even faster, keep reading. Below we discuss a number of useful strategies, some of which may involve quite a lot of concentration and brain power. Always give tableau cards that are lying on top of a face-down card priority over cards you can move from the waste pile. For example, if there is a black 6 face up and you have a free red 5 on the tableau and on the waste pile, give the card on the tableau priority, thereby revealing a new card, since that is what we want to do to win as quickly as possible. 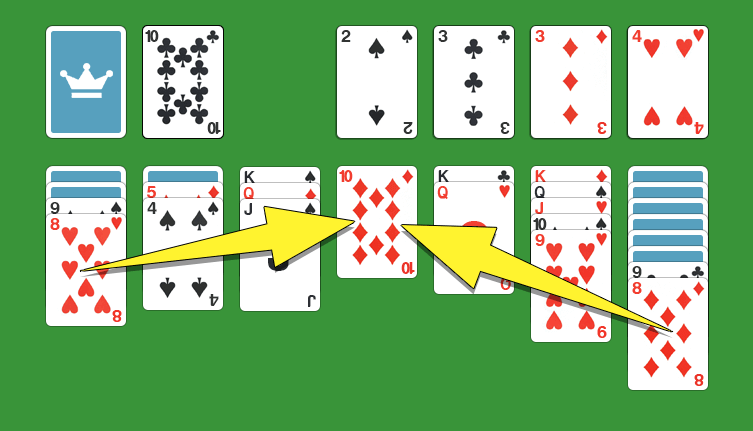 Just like the original Microsoft Solitaire card game, many versions actually have an undo button. You can use it when you make a mistake, but you can also use it to look under cards. This is especially useful for double cards. For example, as you can see in the image above, column 1 has a movable black nine (together with the 8), as does column 7. They can both go on the red 10 of diamonds. First, you move the cards from column 1 to this 10, revealing a new card. Can you use this card? If not, click the undo button and try the same with column 7. Chances are you’ll find something useful under one of these two cards. Try to keep the playing cards that are being moved to the foundation as balanced as possible. For example, if the sequence of the spade stack is already all the way up to the Jack and you still have to start the heart stack, you can get pretty stuck if you have to clear lower cards. One way to win the game quickly is to first go through the entire stock pile and try to memorize which cards it contains. You probably won't be able to remember them all, but they should still be in your head. Next, try to think about how you can combine these cards with the tableau cards. You can go through the stock pile several times of course, because it won't lose you any points. Another way is to first find all the Aces in the stock pile, clear those to the foundation, then look for all the twos, etc. This way you can fill up part of the foundation in no time at all - as long as you can find the right cards, of course. On the left side of the tableau are the fewest cards. Try to completely clear these as quickly as possible and put down a King. Next, do the same with the second column. After all, the King is the highest card in the Solitaire game, so we want to get rid of it as soon as possible. Only do this when you have a King available immediately, otherwise it's a waste of an empty column. The earlier you clear or sort high cards such as the King, Queen and Jack, the more likely you are to win the game. Most of the games have useful key combinations. For example, you can use CTRL + Z to undo a step and you can use the D key to draw a new card for the waste pile. You need a keyboard for that, of course!